Applications: These zirconium sleeve belts are effective on harder steels such as stainless steel and will give longer life on mild steel. Ideal for graining and finishing sheet metal using hand held finishing machines such as the Finimaster II or Poly PTX. 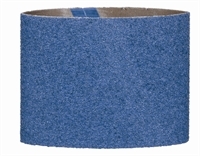 Tough and durable zirconia abrasive grit giving good aggression from the abrasive sleeve. A strong cotton backing gives good grinding characteristics whilst allowing some flexibility to help prevent chatter / bounce marks on the work-piece. Our standard range includes grades up to 120 grit. Also Available: Finer grades are available in premium aluminium oxide sleeve belts or you might wish to achive a fine, consistent finish with surface conditioning sleeve belts. We have replacement wheels for most finishing machines.